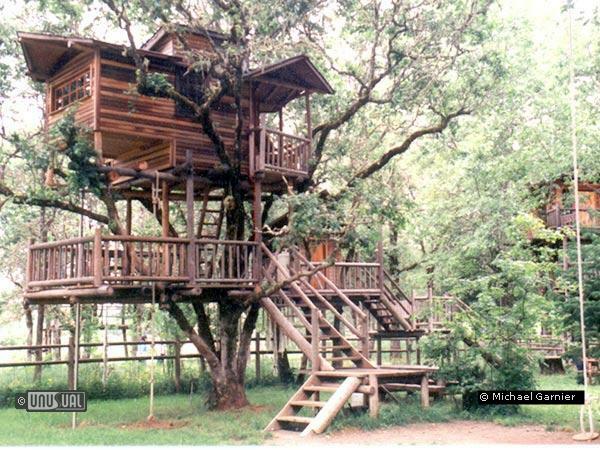 Variety of tree house facilities and fun with this passionate advocate of outdoor living. Out 'n' about is a truly unique place. It is not the Ramada or Hilton, but a four star Tree sort. 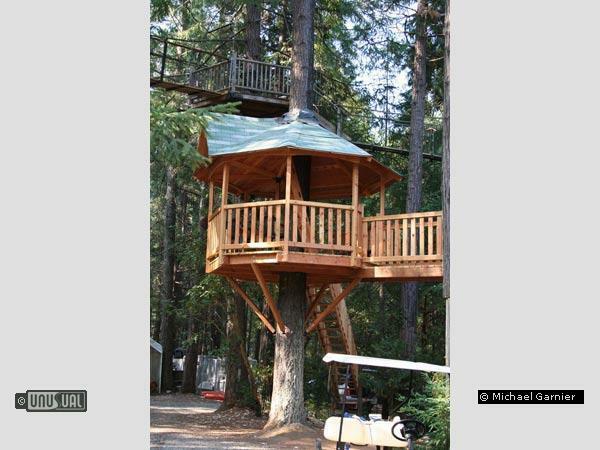 There is a total of 18 different tree house’s, platforms, forts and one floating ship "piratree" (8' to 52' off the ground), seven swinging bridges (8' to 32' off the ground and 12' to 90' long), five swings, 20 flights of stairs, four ladders and a ropes course with a 160' long zip line. On the ground there is also a fresh water swimming pool, stage, bath house pavilion, campfire site and barbecues. The tree sort has 36 acres backed up to the national forest with 16 horses, two rocking horses, 4 dogs, 0 cats, and 8 chickens running around. My best friend and I brought our kids here for Easter and we all had a blast! 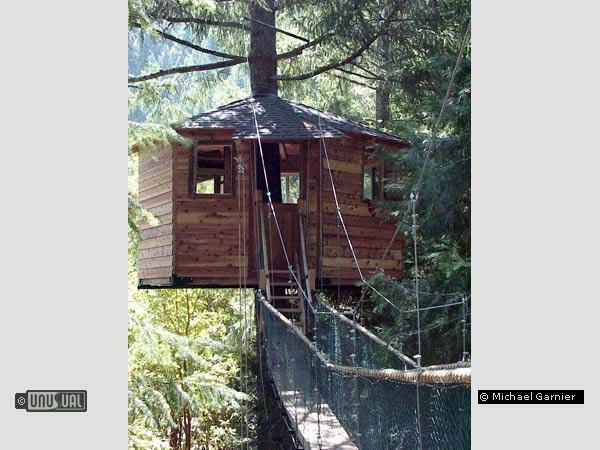 The environment was positive and the treehouses are amazing! We stayed in the Forestree, which offered a sink, toilet (surrounded by a curtain) and a small fridge. The kids really loved the swinging bridges. A delicious breakfast is provided daily and the caverns are just a hop, skip, and jump away. It was one of our best vacations ever! I had traveled fairly extensively with my 3 children when they were young. 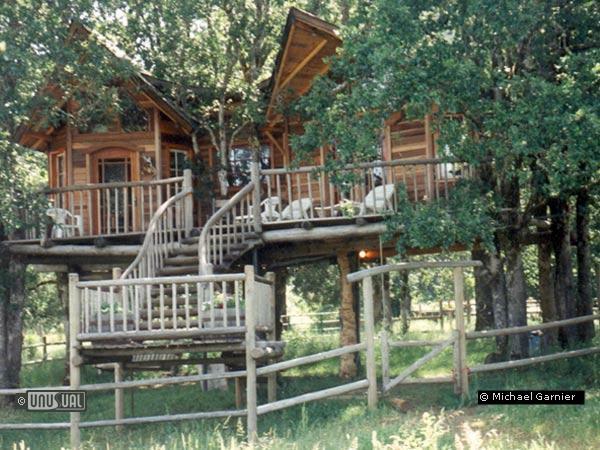 They are all in College now & say their most favorite vacation ever was our stay at Out'n'about Treesort. I am a Nanny now & reccommend this unique Vacation Spot to all families I come in contact with! No matter what age, everyone will like Out N' About! I've been there 3 times and always stay in the highest one 35 ft in the air. 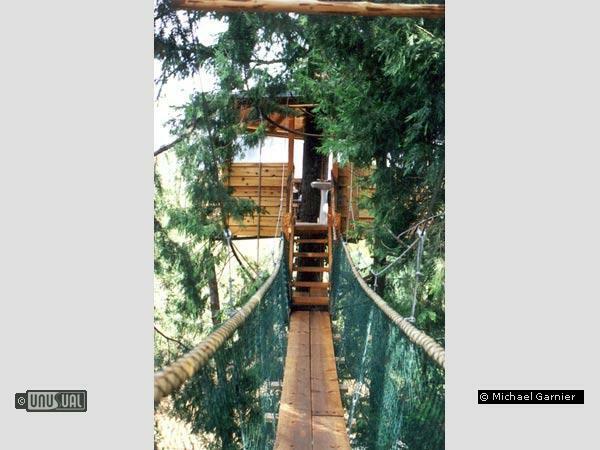 Of course, if you are scared of heights, you can stay in the cabin on the ground or the ones with just a few stairs. The downside is that the location is way out in nowhere...but that is the beauty of it. Bring a book or spend time with friends and family. The campfire is a time to meet your tree neighbors. The best thing to do is bring your own food and cook it on a BBQ provided. There is a small shared kitchen w./ a refrigerator and microwave. The restroom facilities are really nice--if you stay 35 ft in the air there's a toilet and sink! The zipline is great fun. The breakfast is yummy. You can go anytime of the yr as there's heat in the winter. I'd recommend going in the off-season and calling months in advance for summer reservations. i stayed here, it's pretty awesome there is even electricity in them, and there is a nice dining hall where they serve breakfast and dinner, and in the field there is a huge 600 yard zip-line which is extremely fun, plus they have horseback riding through beautiful wilderness. This is a really neat place. I've never stayed here overnight but I've visited a friend of my aunt who lives near there. I would recommend it for anyone seeing that part of Oregon. I wish my kids were still small. They would've loved this, and I could've had an opportunity to climb trees again.